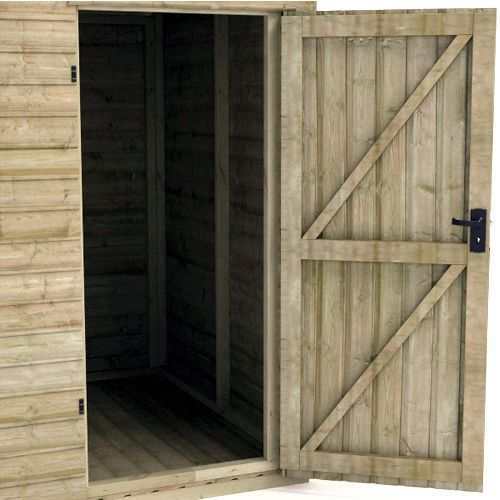 Impregnated with Tanalith, the latest generation wood preserver, the shed is completely protected against all forms of decay and insect attack, and has a greatly extended life, guaranteed for 15 years. 8 x 8 pent shed. Excellent quality shed, I'm sure will last a very long time !! A remarkably strong and well made shed. Very happy. Arrived on time. 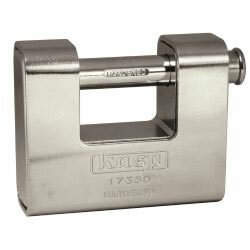 Easy to put up and feels sturdy. 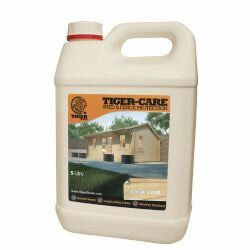 This is my second pressure treated pent Tiger Shed. 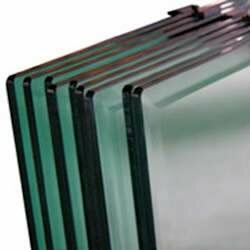 The first was brilliant and the second is just as good quality! Excellent communication from the company and prompt delivery. I’d definitely recommend. 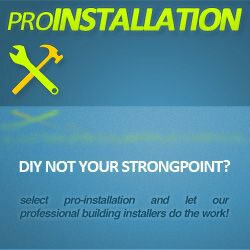 Excellent experience from start to finish thanks. 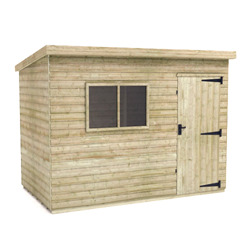 The Tiger Elite Pressure Treated Pent is surely the best pent shed available online. 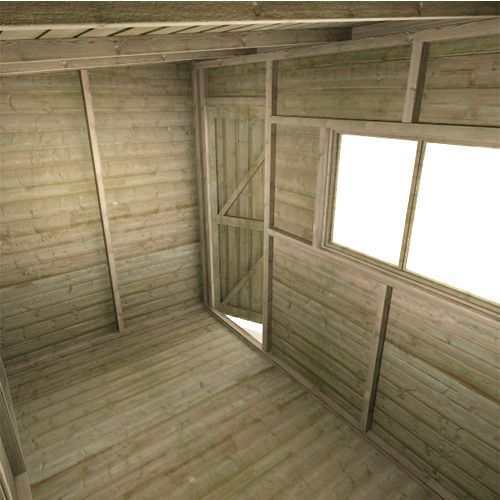 Impregnated with Tanalith, the latest generation wood preserver, the shed is completely protected against all forms of decay and insect attack, and has a greatly extended life, guaranteed for 15 years. This fantastic building comes with a high quality joiner made door, positioned as standard to the right of fantastic joiner made mortice and tenoned windows. 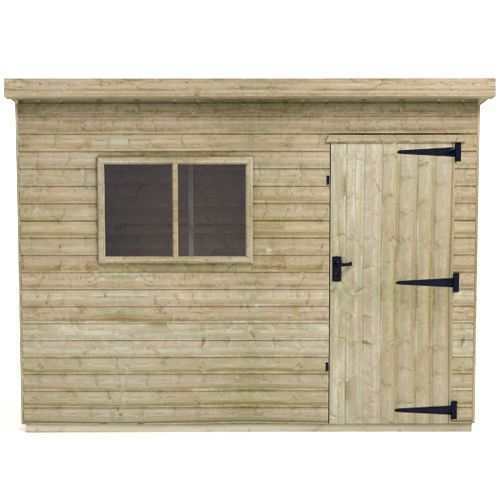 This building is based on the popular pent shed but has thicker pressure treated cladding (at an incredible 16mm thick finish size) and heavy duty 58 x 44mm rounded four corner framing – none of the cheaper thinner rough cut framing you find on most competitor sheds which are much more prone to warping and splitting. 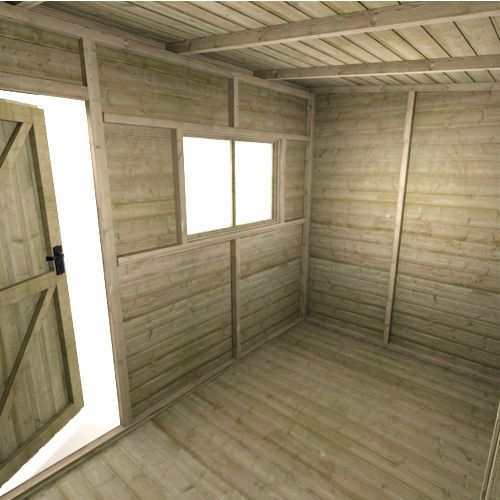 Furthermore, the building is incredibly high, even higher than our standard pent sheds giving you all the headroom you need. Not only is this building functional, long lasting, and stylish, but it is decorated amazingly well too – there are antique handles to go with the heavy duty hinges and three lever security lock. There is heavy duty green mineral roofing felt to cover the roof and heavy duty pre-attached pressure treated floor joists to raise the building from ground. 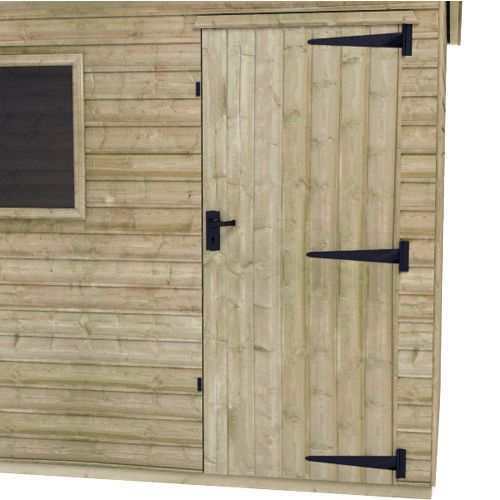 THIS PRESSURE TREATED PENT SHED is clad with high grade pressure treated 16mm finish shiplap tongue and groove cladding – beware of pressure treated pent sheds that feature poorly finished rough edged boards milled out of inferior timber often with a thinner finish. 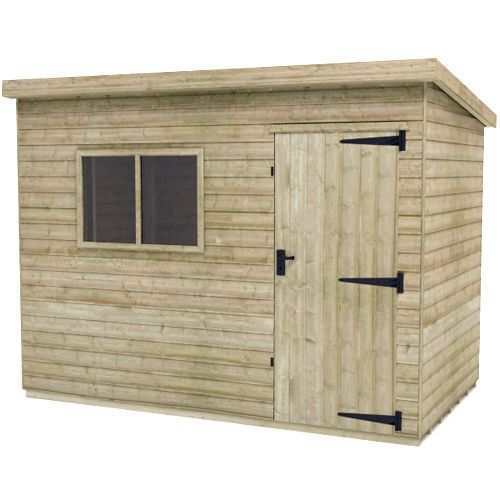 THIS PRESSURE TREATED PENT SHED features double heavyweight pressure treated 58x44mm finish framework throughout giving it the strength to last – beware of buildings that use rough sawn ‘matchstick thin’ framework that barely hold the building together. 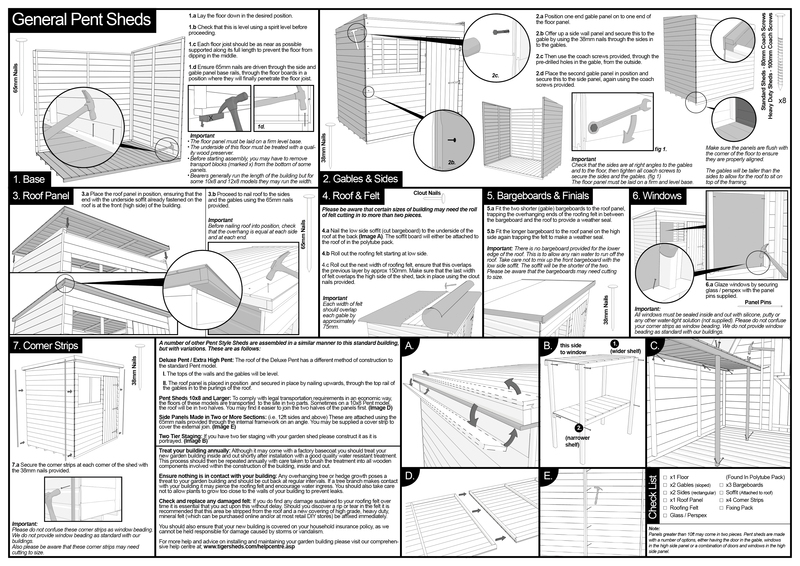 THIS PRESSURE TREATED PENT SHED features thick tongue and grooved floorboard in the floor and roof sections and contains NO cheap sheet materials such as OSB or chipboard – beware of pressure treated pent sheds that use single piece OSB / chipboard roofs that offer little protection in the areas where you need it most. 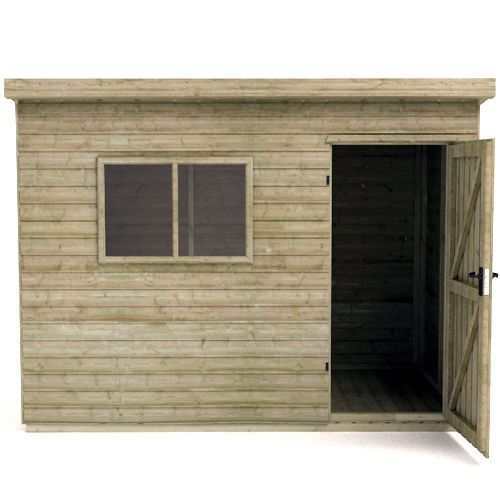 THIS PRESSURE TREATED PENT SHED retains our incredible internal height – beware of buildings that are incredibly low making it difficult to stand up inside.